Science Engagement Programs offers innovative and engaging programs designed to inspire youth to discover exciting topics in science, technology, engineering, and mathematics (STEM). 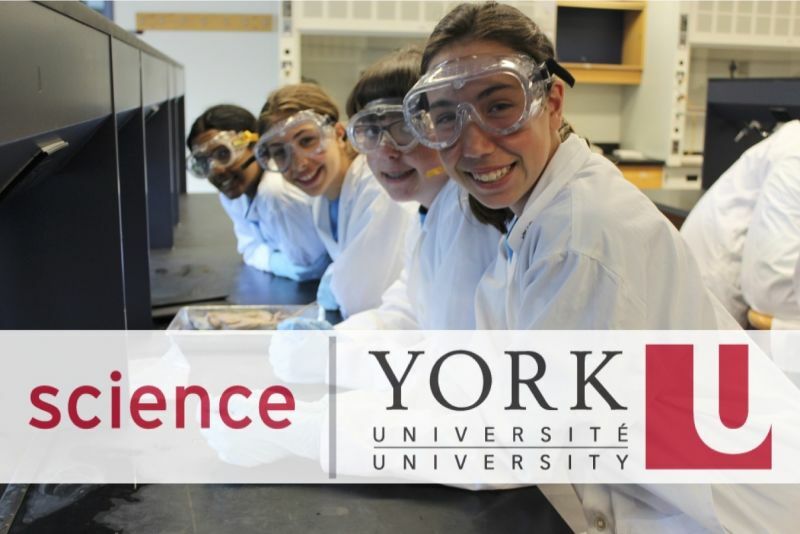 Out of the Faculty of Science at York University, our programs use a discovery and inquiry-based learning approach that is focused on ‘learning by doing’. We offer year-round programming for students in grade 3 to 12. In his memoir “Uncle Tungsten,” the late Oliver Sacks wrote at length about his boyhood chemistry experiments, cloistered away in an attic, exploring a world that, in a range of ways, captured his intellect and his passion. The one thing that it wasn’t, however, was social. Like so many of the science stories of the past—Galileo, Tesla, Newton, and on and on—an interest in science meant working alone. Happily, with the growth of STEM programs, we’re getting beyond that. More than ever, science is collaborative, socially engaging, and fun, all things that the York programs have long sought to bring forward. The sessions engage with the outcomes of the provincial curriculum, and build off what the campers are learning during the school year. But the sessions also extend that in a range of meaningful ways, through hands-on, cooperative learning. Students work within a professional setting, lead by student leaders that themselves are working in those fields throughout the year. All of that can be transformative to a young person’s love of science and their place within it, and in growing an ability to collaborate creatively with others around a unique set of problems. The facilities, as you’d expect, are exceptional—a majority of the sessions take place within Faculty of Science at the Keele Campus of York University—as is the organization of the programs and sessions. For some campers, it's an introduction to university life, and you’d be hard pressed to find a better one. Every year the Faculty of Science at York University joins forces with Main Street Markham to present Science Rendezvous at the award-winning Markham Farmers’ Market. This year’s Science Rendezvous will be held on May 11, 2019. York University scientists and students will be on site all day to answer today’s most burning science questions and conduct exciting demonstrations, hands-on activities, and cool experiments! Get your hands dirty with some of the leading scientists in Canada. Come make your own slime, pet a comet, dig for dinosaurs, make monster bubbles, and more! I had a great experience at Helix Summer Science Institute. The course was very interesting and I not only go tot learn the material, but had the chance to have hands-on experience. This course was a lot more than I was expecting. The instructor was very helpful and interesting and did a great job of teaching the course in a way in which we could learn easily. Many of the questions I came here with have been answered. Through the course that I took at Helix, I learned a great deal. It provided me with the opportunities to learn more complicated and challenging concepts that I desire and it was really nice meeting and working with like-minded peers. It also gave me more insight into what it would be like to student science in university, and has helped me with making decisions concerning my future. Details: Legal guardians of children and youth who wish to register for a Science Engagement program are eligible to apply for a bursary. All applications will be assessed based on financial need and in accordance to Science Engagement Programs' Bursary Policy. While all eligible applications will be considered, the highest priority will be given to applications that have not received funding from the program in the past and that demonstrate financial need. Please note that applications that have previously received two bursaries from Science Engagement Programs within the most recent five-year period of application will not have their applications assessed on a rolling basis. Those applications will only be assessed after the first application deadline has passed and if funding remains for that program.